Get advice from renowned soil health experts. Regenerative agriculture is a dramatic departure from many traditional farming practices. 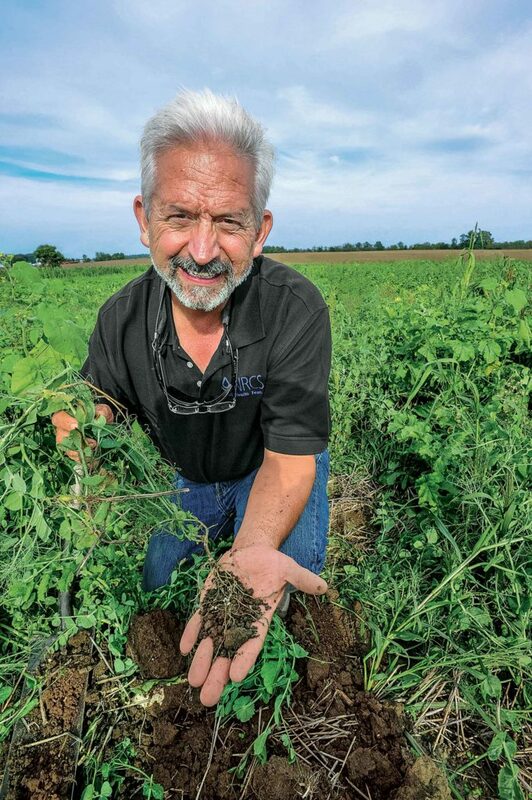 Trusting cover crops—rather than herbicides-—to control weeds; soil microbes—rather than commercial fertilizer—to provide crop nutrients; and beneficial insects—instead of insecticides—to control pests is a change some have likened to “getting a brain transplant.” In that case, a farmer would surely need to consult a specialist, and fortunately there are some soil health specialists available. Several of the rock stars of the soil health movement have teamed up to form UnderstandingAG, LLC, a new business partnership that is providing regenerative agriculture consultation services to a wide range of farmers, ranchers, businesses, and conservation organizations around the globe. Gabe Brown, Ray Archuleta, and Allen Williams are the group’s founding partners, but they’re joined by an expanding list of consultants and technical advisors. “One of our field consultants will visit a client’s farm or ranch to evaluate the operation, determine their customer’s wants and needs, and gather some baseline information, such as standard soil tests, soil health tests, water quality evaluation, and others. UnderstandingAG’s three partners—and other advisors—then review the report and develop a plan to regenerate the operation. Our passion is to allow clients to develop healthier soil, produce healthier food, and reap healthier profits,” says Brown. UnderstandingAG LLC while Steve Groff hosts on-line training sessions as the Cover Crop Coach. Archuleta, a soil and water conservation specialist retired from the USDA-NRCS, and Williams, a sixth-generation South Carolina farmer and champion of the grass-fed beef industry, aid in developing farm plans. A team of field consultants lead by Holton, Kansas, farmer Shane New is being expanded from its current number of seven. The consultation service is provided at a cost of $1,500 per day. UnderstandingAG (understandingag.com) was recently formed when Soil Health Consultants LLC, a two-year old partnership of the same members—plus Ohio cover crop advocate Dave Brandt—was dissolved to free up a third entity—Soil Health Academy. Brown explains that the change was made so the Soil Health Academy—which provides hands-on in-the-field training to farmers and ranchers—could operate as a nonprofit organization better able to accept financial support from an increasing number of soil health-minded philanthropic organizations. The Soil Health Academy—now managed by Brandt—offers extensive three-day training at various locations for a cost of $1,275. “We ask all clients that we work with through UnderstandingAG to attend a Soil Health Academy at their earliest convenience as it greatly aids their understanding of regenerative agriculture,” says Brown. Groff delivers his training through speaking and training engagements as well as on social media and the internet. In addition, a $299 annual fee buys membership in his Cover Crop Innovators internet group where a global network of farmers, agronomists, and trainers share their cover crop successes and caution against common pitfalls. Groff hosts weekly webinars on pertinent cover crop topics with the group that include question and answer opportunities for participants. Currently, 96 past webinars are archived and available for review. Consider your future needs when building barn infrastructure. Novel cooperative links urban families to a diversified farm.